In the wealthiest nation in the history of the planet, people still struggle with resources. They work so hard to achieve success, but without the component of careful planning, they may never get a firm grip on their assets. You need a financial coach just like you need a personal trainer. Someone whose expertise cuts out the guesswork and long hours. Someone who has been trained to think long term and you plan for your financial future. Why? Because people aren’t programmed to make smart financial decisions intuitively. We went from a time of scarcity to overabundant resources, from short life expectancies to living decades beyond our ability to plan. What we have now, we want to spend now. It’s tough to get people to trade current consumption for future consumption, especially when we’re bombarded by cultural messages of spending to showcase our status and worth. In short, when humans try to make smart decisions about money, emotions can get in the way. Even the smartest people have trouble tackling the impulses of the lizard brain. Money is abstract, and people need someone to help them conceptualize the impact a decision today will have on their futures. Even saving 20% of every paycheck can help tremendously over the course of your life. What most consumers don’t realize is that help is available. You don’t have to live like a pauper to be secure. We’re the human part of the business. Investing is easy. You can program a machine to understand smart investment strategies, but you can’t teach a machine to understand humans. WorthPointe’s advisors save people financially, one life at a time. How? By sitting down and having a frank discussion, the kind of discussion people don’t ever get to have with anyone else in their lives. What do you want to accomplish, and who do you love? 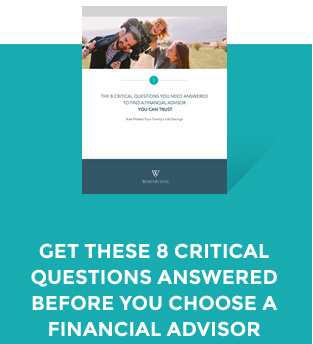 Those are the crucial questions at the first discovery meeting where a talented financial planner’s skills as a good listener and creative problem solver will make a real impact on your life. When you share these deepest truths and fears with a trusted wealth manager, no matter how productive you already are or how far down the road to ‘success’ you’ve traveled, you’ll benefit far more in the long run. WorthPointe’s people see who you are, where are you in the cycle of wealth acquisition, and what you need to correct to get you on the right path. You can’t get that from a machine. A machine can’t read emotional tells, like when you look away at the mention of your brother. And a machine certainly can’t interpret how that might factor into your life goals and financial fears. Imagine if your doctor gave you a quarterly call to check up on your weight loss goals or a skin condition you had resolved in-office. That’s the extra element of compassionate human connection that sets WorthPointe apart. Through a combination of cutting-edge technology and good-old-fashioned human connection, WorthPointe will walk by your side as you take the journey towards your financial future.